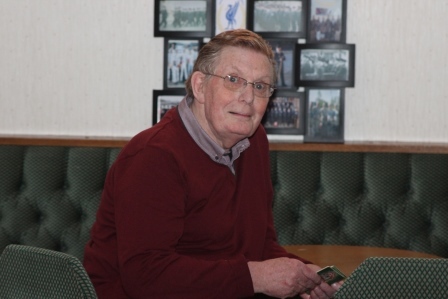 It is with great sadness that on Monday 8th February 2016 Tony Lord passed away at home. The funeral arrangements will be confirmed over the next few days. The 10th. Anniversary of the Reunion Night was another successful night, we hope you agree. Although, at 21.00 hours, we were a little bit concerned at the numbers, 50/60 maybe, but within an hour the hall was 'buzzing', with there being in excess of 3 figure numbers. Many, many thanks to Len Gurney and Dave Phillips for their sterling work in taking so many photographs (see website). Also, thanks to Dave for making a request on Facebook to donate prizes for the raffle on the night and a thank you to all the people who donated. On the subject of the raffle, many thanks to May Hannah, who single-handedly went round selling the tickets and raised over £200. After our expenses, we were able to present Steve Whitfield with £130 to go towards McMillan Cancer Care Trust in memory of his wife Lorraine, who sadly passed away earlier this year, also congratulations to Steve for completing the Cycle Challenge from Manchester to Leeds (60 miles). We would like to thank everyone who attended the Reunion Night and showed their generosity in donating to the raffle. We would like to thank the Bar Staff for putting up with us again and to the Longmoor Social Club Committee and especially, John Birkett who took the time to come down to the Club and set up the PA system for us. At our AGM on Friday,24th. April, 2014, there were 5 Retired Staff in attendance; Tony Lord; Mike Thompson; Jack Wilson; Alan Singleton and Pete Barnard. Also present were May Hannah and Bett Price. Apologies received from Dave Phillips; Brian Antrobus; Tony Burke and Jeff Heenan. Our Treasurer's Report showed a balance of £121.32. Refreshments on the Reunion Night would continue and we would try the M & S Selection Box and sausage rolls and pies from Iceland. In our correspondence over the last 12 months was a request from Channel 4 TV, contact details are now on the website. There were emails from the previous Governor John Illingsworth and the new Governor Peter Francis. May Hannah would now organise the tables and music for the Reunion Night. The 'Get-Togethers' would now be more frequent at the request of Jim Danily, revised dates are now on the 'Members Only' page. At Christmas, 174 Christmas 'E' Greetings Cards were sent to all the email contacts. It was decided that the British Heart Foundation, would benefit this year from fund raising. The Walton Retired and Parade Fund met on Wednesday, 6th. October, 2010 and it was decided that the widows of ex-Prison staff, would be welcome to attend our Reunion nights at the Longmoor Social Club. Has any one got any photographs of staff who have passed on, with their year of birth and year of death, so that we can add the photographs to our dedicated page for them. All photographs will be returned and if they are e-mailed, please send them in jpg. format. Contact anyone involved with the Parade Fund at the Prison. Any retired member of staff wishing to become a 'LIFETIME MEMBER', please contact us. The cost is a one off minimum donation of £5.00.